I’m in Cuenca, Ecuador, at an altitude of 8300 feet and I think I’ve got a touch of altitude sickness (soroche). My heart beats quickly and I have to catch my breath. Climbing stairs in our hotel or up the barranco (cliff) leaves me winded. When I lay down to sleep, I can’t; insomnia is my partner. Luckily though, I do not suffer any headaches, a common altitude ailment. 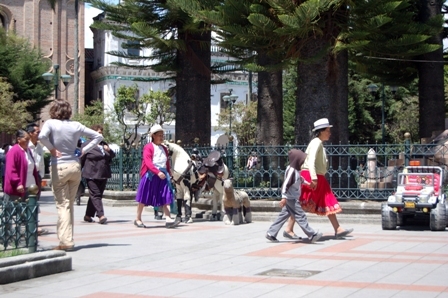 This is a charming old colonial city in the southern Andes Mountains with genteel people, cobblestone streets, and year-round spring weather that results in blossoming flowers everywhere. There are art galleries and cultural cafés like the exquisite El Otorongo (galeriaotorongo@hotmail.com) where owner Magy Pena welcomes you with a personal tour of her first-class showroom. El Parque Calderón, the city’s main square, is a peaceful haven for people-watching, warbling birds and colorful flowers. So what’s an ailing body to do? Acclimatization usually happens within a few days, but if it doesn’t, don’t despair. Learn to listen to your body. Take your time as you explore the area; there is no harm in casually strolling. Take a lesson from the Cuencans around you. They aren’t rushing around. Little appetite? Eat lightly, taking small snacks instead of big meals. The most important hint, though, is not to become dehydrated. Keep up your fluids. 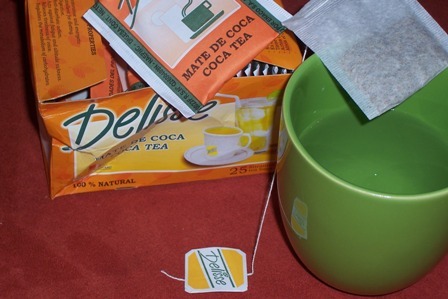 The best advice in this department is to sip Mate de Coca (Coca Tea). Its properties are restorative and energetic, an antidote to altitude sickness. Cost: about US$2.50 for 25 tea bags. I got mine at a local health store. And guess what? I’m beginning to breathe properly again without a jumping heartbeat.